A big shout out to everyone – we are expending our circle of friends and offering a little thank you present to our supporters. Now you can get a bonus if you are active in social networks. 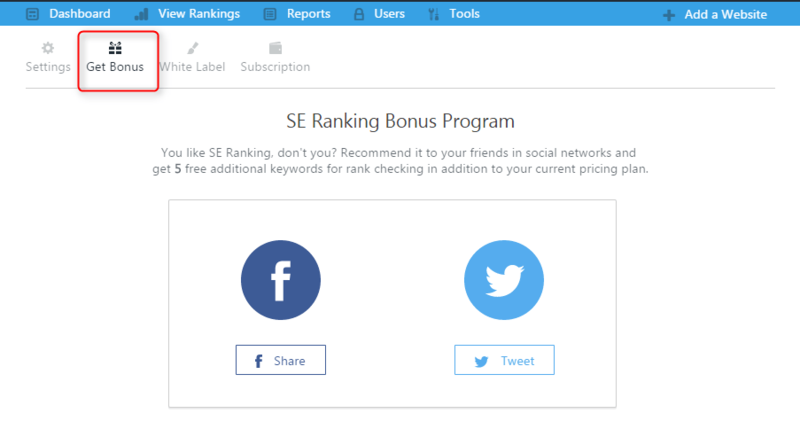 Make a post about SE Ranking in Facebook and Twitter and get 5 free additional keywords for rank checking in addition to your current pricing plan or even you can fill up your balance, if you pay for each rank checking. In your account, you will find the section “Get Bonus” and you can make any of these actions you want. Now you can get bonus only for tweets and FB posts. In future, you can get a bonus for forums, blogs and partners.